Former Army Captain Luis Carlos Montalvan was wounded both physically and emotionally from his two tours in Iraq. Suffering from a traumatic brain injury and also post traumatic stress disorder (PTSD), Montalvan eventually stopped leaving his apartment and withdrawal caused him to turn away from friends and family. But all that changed when Tuesday came into his life. As a service dog, Tuesday helps Montalvan with basic tasks of everyday life that his physical and emotional wounds have made difficult for him, such as walking down stairs and boarding a crowded subway. Tuesday can even sense when Montalvan is about to have a panic attack and is there to help get him through it. But Tuesday gives Montalvan so much more than support. He is a companion in every sense of the word and together they help educate communities about people with disabilities and the need for wounded veterans returning home to be given the care they deserve for serving their country. About a year ago Luis Carlos Montalvan came to my town's public library to talk about his memoir, Until Tuesday, and it was so heartwarming to see the impact service dogs are having on these physically and emotionally wounded soldiers. I am elated that Montalvan has adapted his story into this beautiful book for children. I have and always will be a dog person, so I know what a comfort these animals can be in times of sadness, as evidenced by the spate of places that are now using therapy dogs to help with things as simple as helping people feel less stressed (like at nursing homes and even college campuses) to libraries, bookstores, and even teachers using them to help kids read, to helping victims of tragedies grieve, dogs truly are man's best friend. If you are a dog-lover, this book will melt your heart. 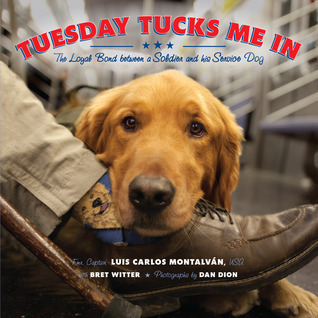 But even if you're not a dog-lover, books like Tuesday Tucks Me In and also Montalvan's memoir, Until Tuesday, are still important reads because they bring to light the need for us as a country to take better care of our veterans. Providing them with service dogs is a step in the right direction. For more information about Luis Carlos Montalvan and Tuesday, check out their website. Also read this beautiful review of Tuesday Tucks Me In by Margie Myers-Culver. These are two books we do not know --we look forward to checking them out! We are both dog lovers so we are sure these will appeal to us. After your review and Margie's, I'll have to check it out! Looks like a book a lot of kids will enjoy too! Oh Beth, thank you for sharing these two books. I know that dogs can save so many. It's great you were able to see Montalvan speak too. Oh wow. This sounds like an amazing book to share. I will look for it. Thanks! Oh my word Beth, this just looks amazing! Thanks for sharing!